Bob P., or Bob Plant, was a good friend of Jim Parks. Bob was very interested in Sis up until the night Sis introduced him to Ginny. Bob and Ginny began going steady, later got engaged, and eventually married. “Bob Plant was one of Jim's friends and we kidded him around because he worked on the garbage trucks and told us stories about his job. They chalked-up the rats they killed on the side of the truck, just like the pilots marked up the planes they downed on the sides of their aircraft. Bob would go on to work for Chicago's Streets & Sanitations Dept. for the remainder of his life. 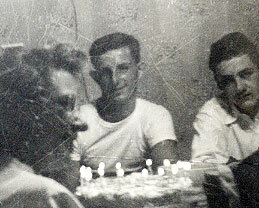 Bob Plant, center, with Dee and Herb Martin, at Sis' 16th birthday the night Sis fixed Bob up with Ginny.